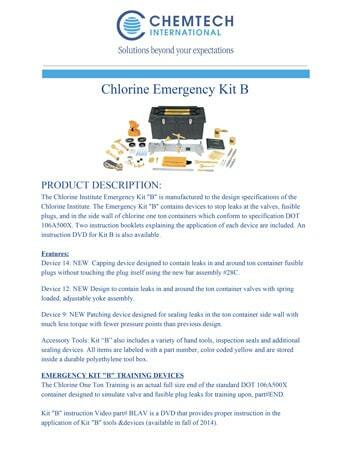 Chemtech International Inc. is an authorized distributor of Indian Springs Manufacturing Co. chlorine emergency kits designed to effectively stop gas leak from chlorine and ammonia gas cylinders and containers. Chlorine is an essential building block for a wide range of products we use every day for public health, nutrition, safety, transportation and high-tech innovation. Drinking water, electronics, disinfected wastewater, industrial chemicals, pharmaceuticals, automobile parts and agricultural abundance all depend on chlorine. Chlorine, however, can cause severe health and use hazards, if precautions are not taken to stop a chlorine leak. Manufactured based on the design specifications of the Chlorine Institute, Indian Springs Manufacturing Co. is committed to the safety and proper handling of chlorine. 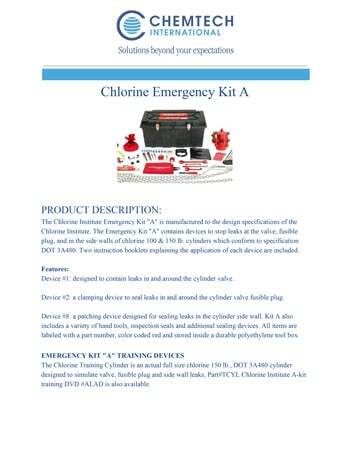 The Emergency Kit “A” and “B,” respectively, contain devices to stop leaks at chlorine valves, fusible plugs, and in the side walls of 100 or 150 lb. DOT 3A480 cylinders and one-ton DOT 106A500X chlorine containers. 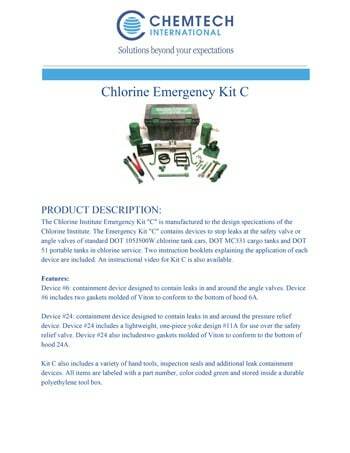 The Emergency Kit “C” contains devices to stop chlorine leaks at the safety valves or angle valves of DOT 105J500W chlorine tank cars, DOT MC331 cargo tanks, and DOT 51 portable tanks. Instruction booklets and/or videos are provided to explain proper application and usage of all devices within each emergency kit. Each kit also includes a variety of hand tools, inspection seals, and additional leak containment devices. All items are placed within a durable polyethylene tool box for easy storage and portability.